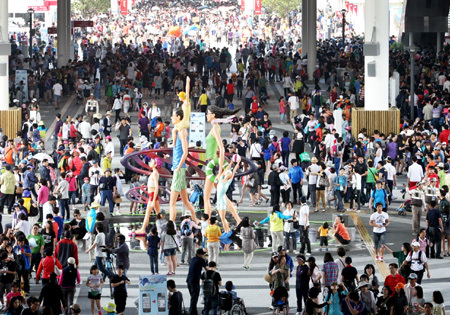 The 2012 Yeosu Expo's reservation system for eight major exhibits has caused an outcry among visitors over the last busy weekend. The system allocates 30 percent of tickets to advance online sales and 70 percent to on-site media kiosks on the day to minimize time spent queuing. The problem occurred on Sunday, when some 100,000 people, about three times more than the usual number, visited the Expo. The popular exhibits were fully booked by 9 a.m., and visitors who had come a long way protested as they were unable to get a hold of tickets despite arriving early. The organizing committee called an emergency press conference and announced that it was scrapping the booking system as of noon Sunday. They had been boasting how cutting-edge it was but had to scrap it just 16 days after the Expo opened on May 12. "Although we introduced the system to minimize people's time spent on queuing, we had to drop it due to complaints from visitors," a staffer admitted. This was partly because many visitors are unaccustomed to booking tickets in advance, but there has also been some criticism since the opening of the Expo that the booking system is too complicated to use. Elderly visitors had particular trouble getting tickets. Some critics said the organizers should not have thrown out the baby with the bathwater and scuttled the whole system due to a few complaints. Tickets to all 77 exhibitions are now sold on a first-come first-served basis.